“Moderators” is user group with specific privileges mainly focused on managing the existing forums on your Board. If you are managing a lot of forums on your board you will probably need some additional administrative personal to help you with this task. 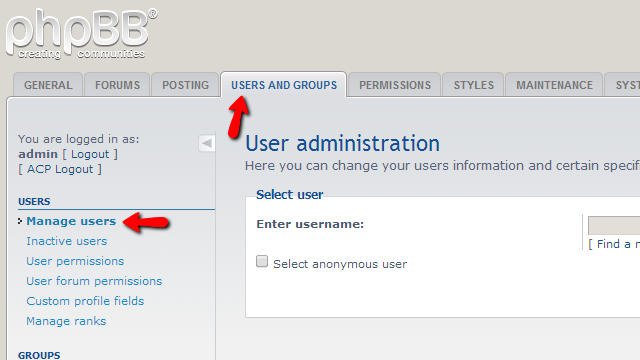 Since you will be managing your users you will need to login into the Administration Control Panel of your Board and then you will need to navigate to Users and Groups>Manage Users. On that page you will notice a single field called “Enter Username” where you should simply put the username of the user you would like to make a moderator. Once you enter the username of the user you will need to click the Submit button so you can move forward with the tweak. On the next page you will be presented with all of the settings related to the user profile of the selected user. At the top right corner of that page you will notice a drop-down list of options named Select form. You will need to select the Groups option from that list. Then you will need to click on the Go button so you can be presented with the information regarding the groups the selected user is part of. On the next page you will see a table view related to the Pre-defined groups user is a member of. Bellow that table view there is a drop-down list named Add user to group. From that list you should choose the Global moderators option and finally you will need to click on the Submit button so you can save the change. That is all you need to know in order to make existing user a moderator on your Board.